On Saturday 22nd May 1926 Miss Lily Elsie opened the new cricket pavilion at Redmarley Cricket Club, Gloucestershire. Her husband, Major Ian Bullough gave £30 towards the cost of building the pavilion (Total cost £44/15/-) and also for a new set of kit to be bought. The new pavilion was a 20x10ft cream painted wooden structure. Major and Mrs Bullough lived at Drury Lane Farm, just a short walk from the cricket ground. (Drury Lane Farm, now renamed Drury Lane House, has recently been divided into four apartments.) 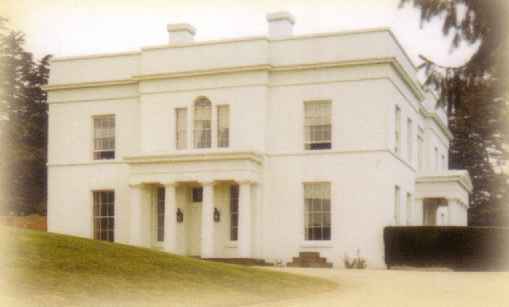 Sir George Bullough, Bart, (Ian's half brother) was president of the cricket club and gave the rent for the ground. In the game that followed the opening ceremony Ian Bullough was bowled out for a duck! Sir George Bullough - Club President, and Lady Bullough. The event was reported at length in that week's edition of the Ledbury Reporter and Guardian. Mrs Ian Bullough said she was very proud and pleased at being asked to open that pavilion that day. When Major Bullough first started the Sports' Club he then used to say that he hoped and believed it would do good all round and help those wonderful feelings and good fellowship and comradeship. That pavilion proved that wonderful spirit had won through, and to all those who had been trying for it, it meant a good deal. She hoped the cricket eleven would have a very successful season and win a lot of matches, but even if it should not be successful in that way that little pavilion would help to remind them that whether winning or losing it was the game that was the thing. In conclusion, Mrs Bullough said she had much pleasure in declaring the pavilion open. Little Elizabeth Niblett [whose birthday it was that day], daughter of the Rector [Cricket team captain] and Mrs. Niblett, then presented Mrs. Bullough with a very fine bouquet of carnations, which was from the sports club members, as a token of their appreciation to Mrs Bullough for opening the pavilion for them. Mrs. Bullough then unlocked the door of the pavilion. The pavilion that major Bullough kindly paid for was replaced after nearly fifty years of service in 1973. Further improvements have been made since then. Ian Bullough's sporting interests were not limited to cricket. In 1924 he had started the Redmarley Football Club, paying for two sets of jerseys, goal posts, etc. with himself playing centre-forward. The club was suspended, however, in the 1930's [Ian Bullough died in 1936] and it was not until 1946 that, after permission had been obtained from the A.F.A. that the club was re-formed and entered the Ledbury [Market town in Herefordshire, UK] League. Some indication of the manor in which Major and Mrs Bullough lived, in particular the number of staff they employed, can be gained that it was said during Major Bullough's period of residence at Drury Lane Farm ["Hillfields"?] the estate could field its own cricket team and frequently played a team from the Down House which was then owned by Ian's half-brother, Sir George Bullough. The difference made in the district through reduction of staff at Drury Lane Farm on the departure of Major Bullough was big enough to be noticed in the school records of the time. Lady [George] Bullough was chairman of a social organisation which was formed for women in 1924 - "The Redmarley and Staunton Womens' Unionist Association". A yearly subscription of 1/- was paid and the aim was a social evening with tea, political talk, music, games, etc once a month. Lily Elsie entertained at some of these meetings with her singing. Basil M Niblett Captain. (Basil Morton Niblett became rector in 1925-59. Elsie's mother is buried in the churchyard. Click here for details.